One of the great conveniences today enjoyed by the food consumer is bagged fresh salads. Washed, mixed, and nicely packaged, these products eliminate the annoyance of salad preparation and are just waiting to grace one’s table. However, nowadays even seemingly innocuous products must require kosher supervision. Bagged fresh salads are not immune to this phenomenon, as Rabbanim Hamachshirim and kosher agencies face the challenge of certifying these products as insect-free. There are a number of myths associated with bagged fresh salads. Many assume that farmers and companies are wary of insects in vegetables, and take proper precautionary measures to ensure that their inventory is clean from bugs. This assumption may seem reasonable but, in fact, farmers have not been able to consistently grow insect free produce. The FDA tolerance levels of insect infestation in produce are far more permissive than proper halachic standards. For example, the US government allows averages of up to 60 insects per 100 grams in frozen broccoli, and up to 50 insects per 100 grams of frozen spinach (See Food, Drug, and Cosmetics Act 402 (a)(3)). (There are no FDA action levels written specifically for fresh salad mixes, and typically the standard required throughout the industry for leafy vegetables is the frozen spinach FDA tolerance level). Although farmers generally use pesticides to limit insect infestation levels in produce, the effects are often limited. Powerful and highly effective insecticides previously used have been legally banned because of health risks. Some insects have also developed immunity to certain pesticides over time. Moreover, the popularity of organic produce has complicated matters. The term organic usually means grown without pesticides, herbicides, and synthetic fertilizers. Understandably, produce advertised as organic could be subject to higher levels of insect infestation. Farmers have struggled to create an insect-free environment. Some have been largely successful with greenhouses, since incidents of insect infestation in greenhouse grown products have been very rare. Another myth related to bagged salad is that a company’s highly advanced washing system will certainly eliminate concerns of insects from the final product. Although it is true that many companies possess highly advanced washing systems, this assumption is false. The effectiveness of a washing system will depend upon the level of infestation present in the crop prior to washing. High levels of insect infestation will not be sufficiently reduced by an advanced washing system. This is comparable to washing a filthy garment in the laundry. Despite the detergent and expensive washing machine, sometimes it is necessary to wash very filthy clothes several times in order for the clothes to become clean. Insects are often very hard to remove. Aphids and thrips (these are small insects that are commonly found in vegetables) cling to vegetable surfaces, and their legs can become embedded into the leaves. If the presence of insects in a shipment is high, running a product through the system once will be insufficient. Nonetheless, if the company’s standards are met the salad mixes will be bagged, distributed, and sold to consumers on supermarket shelves. The manufacturing procedure for bagged salad may vary slightly between one company and the next, but the primary aspects of the operation are typically similar. Produce is delivered to the processing site after undergoing a light pre-wash at the farm, or plant. The wash is intended to remove dirt, and does little if anything to remove insects. The produce is loaded onto a conveyor belt at the plant while the outer leaves and cores are removed. The outer leaves are detached since they are subject to the most mold and insect damage. The produce will continue to pass through a shredder and water flume. A flume is a chute-like wash tank that cleans the vegetable leaves. The vegetable leaves will undergo an additional wash prior to being dropped into a bin, and subsequently dried. The vegetable leaves are dried by a machine known as a spin-drier, which dries its contents through high-speed spinning. Once dry, the leaves are mixed into a salad and packed into bags, and are ready for the consumer to purchase and use. How do kosher agencies and Rabbanim Hamachshirim deal with the challenge of certifying pre-washed vegetables? There are three basic approaches. The first is based upon the halachic concept of uman lo meira anafshei (a tradesman will not taint his credibility) (See Chullin 97b, Menachot 43a). This principle endows a non-Jewish tradesman with some level of credibility with regards to his labor (See Orach Chaim MG”A 20:1, Yoreh Deah Shach 98:2). One method of kosher supervision relies upon the company’s Quality Control (QC) Supervisor to monitor infestation levels in salad mixes at a tolerance level of zero (as required by the hechsher) once the washing system at the plant is proven to be effective. Upon the QC Supervisor establishing a zero tolerance level, the hechsher is ink-jetted along with the product’s date code on the bag. To ensure that the washing system remains effective and the company’s QC Supervisor adheres to its requirements, the kosher agency will independently check a certain amount of the washed product. Based upon its reliance of the company’s non-Jewish QC Supervisor, coupled with its maintenance of a chazaka that the plant’s washing system is working effectively, the hechsher is given. This method of supervision has been challenged based upon two considerations. The first concern is that the halachic concept of uman lo meira anafshei may depend upon industry standards, and not halachic considerations. FDA standards are far more permissive than what is allowed by Jewish law, and companies are legally permitted to sell product even when halachic tolerance levels are exceeded. Moreover, it is difficult to establish a chazaka that a washing system is cleaning produce properly when its effectiveness will depend upon infestation levels of the crop. Crop infestation levels vary from one field to the next and can be very inconsistent, even in the same general region. Large salad companies may receive inventory from more than one supplier, and even within one supplying source often more than one field is harvested. Two alternate methods of supervision require checking salad mixes by a mashgiach, based upon several halachic considerations. The Rashba requires that once it is determined that the vegetables are prone to insect infestation; they must be checked in their entirety (See Shut Rashba 274, Shulchan Aruch Yoreh Deah Rema 84:8). Rav Shlomo Kluger writes that by checking three vegetables from the same field, and finding all to be clean, a chazaka1 is established that the infestation level of that particular field falls within acceptable halachic parameters and further checking is not necessary (See Tuv Ta’am VeDa’at 1:123). According to Rav Kluger the establishment of a chazaka is a sufficient level of checking, even according to the Rashba, when the prevalence of insect infestation in a type of vegetable does not exceed miut hamatzui. It has also been quoted that Rav Aharon Kotler zt”l allowed for this type of practice as well. One method of supervision followed by some hechsherim allow for mashgichim to check bags of final product from salad companies in order to establish a chazaka that a particular shipment is clean of insects, with the checking done at a distributor’s warehouse. 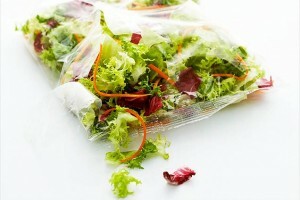 If the bag samples are found to be clean, the sticker of the hechsher is affixed to the salad bags and are sold by the distributor with the sticker of the hechsher. Another method of supervision followed by other hechsherim will require an on-site mashgiach present at the time of production. The function of an on-site mashgiach temidi is to monitor several safeguards, in addition to establishing the chazaka. The mashgiach will check shipments of produce prior to processing to assess that infestation levels do not exceed moderate, evaluate the washing and filtration system at the plant to ensure that it is functioning optimally, besides checking considerable samples of final product to ascertain that the batch is clean. The Orthodox Union has assessed both methods over a long period of time, and, based on its findings, has opted to only follow the latter practice. Individual shipments of produce received by a salad company on a specific day must come from the same source, which will allow for the establishment of a chazaka through checking various batches of salad mixes by a mashgiach, whether on-site or immediately prior to distribution. It is very important to note that when a hechsher places its symbol on a bagged salad mix, it is not guaranteeing that each bag bearing its symbol does not contain an insect, but that the product can be consumed with peace of mind without checking for insects. There are three levels of insect infestation recognized in Halacha. Foods typically infested with insects the majority of the time at an infestation level of 50% or higher are considered muchzak betolaim, and one must check for bugs miD’oraisa, since the consumption of insects is prohibited min haTorah. Foods that do not have insects the majority of the time, but are still consistently infested must be examined nevertheless miD’rabbanan (See Shach Yoreh Deah 84: 28 and Sifsei Daas 84:28). The infestation level for what is termed miut hamatzui is often assumed at 10% or higher.2 However, foods whose level of infestation is infrequent and inconsistent, typically below 10%, fall in the category of miut she’eino matzui and are permitted without checking at all (See Mishkenot Yaakov Yoreh Deah 17). When a hechsher appears on a salad bag, the chazaka established by the kosher agency allows one to assume the product is clean from insects. However, finding bugs in the final product is not automatically indicative of a problem. Unless insects are found with some level of consistency, the chazaka will remain intact with the assumption that the product falls within the parameters of miut she’eino matzui. Were an insect to be consumed unknowingly, the Beit Ephraim (see Shut HaChadashot 8) rules that absolutely no prohibitions were violated. In the event an insect is found in a bag of salad, the certifying agency should be notified, and a Rov consulted. The great challenge that faces Rabbanim Hamachshirim today with fresh bagged salad is to ensure that products under their hashgacha are free from insect consumption. Fresh salads may be subject to high levels of insect infestation, and unknowing consumers could potentially transgress numerous Torah prohibitions with the consumption of one insect. It is crucial that Rabbanim HaMachshirim implement proper systems of supervision to protect the kosher consumer. A Rov must be consulted to assess whether a hechsher on a bagged salad is acceptable. 1. According to the strictest definition, the proper establishment of a chazaka entails checking three units of a particular item (See Eruvin 97a, and Shulchan Aruch Orach Chaim 39:8). How that number is applied, and whether additional checking is required in proportion to shipment size is a subject of discussion amongst kosher agencies. 2. There are varying opinions about how to calculate whether a vegetable type falls into the category of miut hamatzui, or miut she’eino matzui, the detailed discussion of which is beyond the scope of this article.